After our wonderful low-key stay in Mississippi, on December 29th we casually made our way north up Highway 61 to South Main Street in downtown Memphis – home of the blues, and birthplace of rock-n-roll. Upon arriving, we had breakfast at the oldest café in Memphis, The Arcade Restaurant. We came upon this establishment purely by accident. The proximity worked for us, as I was due to meet Barbara B. Newman, CEO and president of the Blues Foundation that morning. Since 1919 the Arcade Restaurant has survived all the ups and downs throughout the course of time. The restaurant has two historical markers located right outside, and has been featured on numerous national publications; Southern Living, Esquire and Sports Illustrated, just to name a few. Celebrities from yesterday and today have all eaten and spent time in this wonderful friendly establishment. My only regret was that we couldn’t linger over another cup of their fabulous coffee. 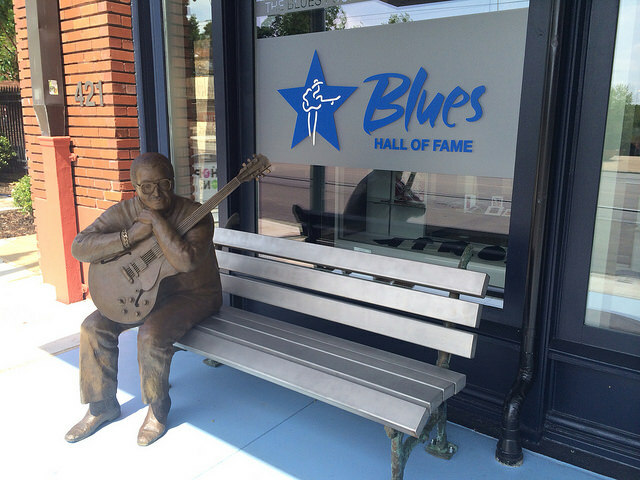 A short walk up South Main Street, as you approach the record-decorated sidewalk in front of the Blues Foundation, sits a cool life size statue of Little Milton. It’s a great photo op, and a very eye catching front entrance. As we entered the bright large lobby, we were immediately greeted by Barbara who was expecting our arrival. After exchanging introductions, we sat down and had a nice chat. In her office, I immediately noticed one thing about Barbara; she sparkles. Whether discussing the recently completed Blues Hall of Fame or her plans for the Blues Foundation, you could see she was passionate about her job. And rightfully so. Having only been in her position since October, Barbara has some big plans to raise awareness of the Foundation, including partnerships with schools, upcoming festivals, and of course continued and expanded awareness of their main pillar programs – The Blues Music Awards, Blues in the Schools, Generation Blues and of course the upcoming International Blues Challenge. After our meeting, Barbara took the time to show us around; taking us through the hypnotic “Cast of Blues” (their latest exhibit) and explaining more about it’s creator Sharon McConnell-Dickerson. The exhibit is just amazing, and it allows you to not only learn about each artist presented, but touch each of the masks, allowing for your own personal experience. For more information on the creator of the exhibit, please click on the link above. As you walk down the wide staircase, you are immediately in front of the main reading nook. The information put together from books composed by and about blues legends is vast and extremely educational. You are one quick swipe and touch from an array of music, biographies, and photographs that relate to each piece and reference to each of the artist, along with links to relative material. The galleries are like mini showcases lining the hall. Each one with it’s own mix of items like posters, records, and clothing. All together there are ten galleries, and I especially loved the two private listening rooms. The staff here are extremely friendly and always available should you have any questions. I could have stayed at The Blues Hall of Fame all day. It was truly a pleasure meeting with Barbara and touring these wonderful exhibits. The BHOF is a must see for any traveler to Memphis, so make sure you give yourself at least 2 to 3 hours to fully appreciate this amazing facility. We were so involved with the Blues Foundation and the BHOF that we were running late for our lunch with Jonathan, of the Memphis Convention and Tourism Bureau. 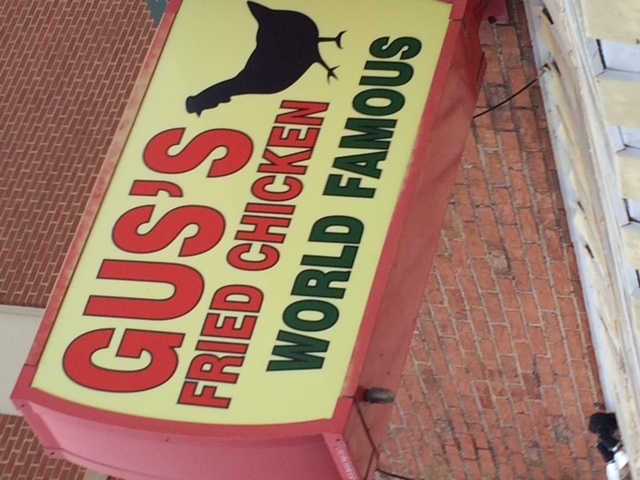 After providing us with some lunch suggestions for local Memphis favorites, we chose Gus’s Fried Chicken. The place was crammed, but after a short wait we were seated. Gus’s is loud, noisy and unpretentious. 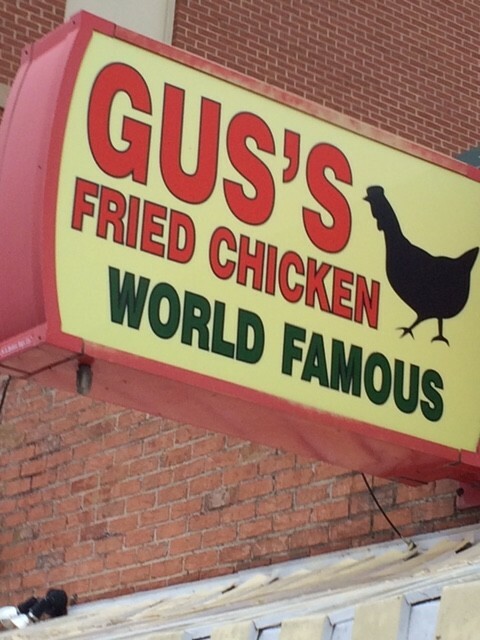 It also happens to serve up some of the best fried chicken you will ever experience. It is slightly spicy, wonderfully crispy, and just perfect. The sides are equally delicious and reflect the down home comfort feel of the place (baked beans, slaw, mac and cheese, fried okra, to name a few). Speaking of Southern flair, our host was the epitome of Southern Hospitality. Jonathan provided us with all sorts of suggestions for attractions, nightlife, and dining. He was a gracious host, and helped us to plan our itinerary to maximize our Memphis Experience. If you’re ever planning a trip to Memphis, make sure you visit the Memphis Convention and Visitors Bureau’s website at Memphistravel.com. They have plenty of advice on where to stay and things to do, as well as an IPhone app to help you plan your trip to Memphis in the most organized and convenient fashion. After Gus’s we decided to check out the Memphis Rock ‘n’ Soul Museum. This museum is a co-operative effort by The Smithsonian Institute and The National Museum of American History. The exhibition tells the story of the birth of rock and soul music, and its early harmonious innovators who overcame huge obstacles to create the music that took the entire world by storm. 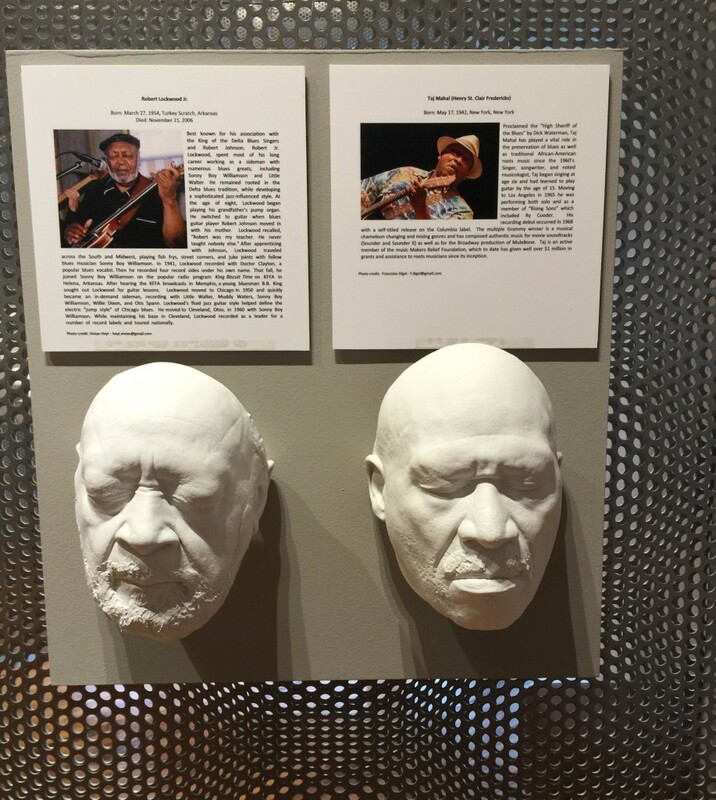 The museum offers an inclusive Memphis music experience from field hollers and sharecroppers of the 1930s, through the days where Sun Studio and Stax’s global influence created some of the most successful and memorable tunes in music history. The museum is located at 191 Beale, on the corner of legendary Highway 61 at the FedExForum sports and entertainment complex. There are three audio visual programs, more than thirty instruments, forty costumes and other musical treasures. The audio tour provides over 300 minutes of information, including over one hundred songs. Once again, you’ll want to allow enough time to enjoy all the galleries at your leisure. 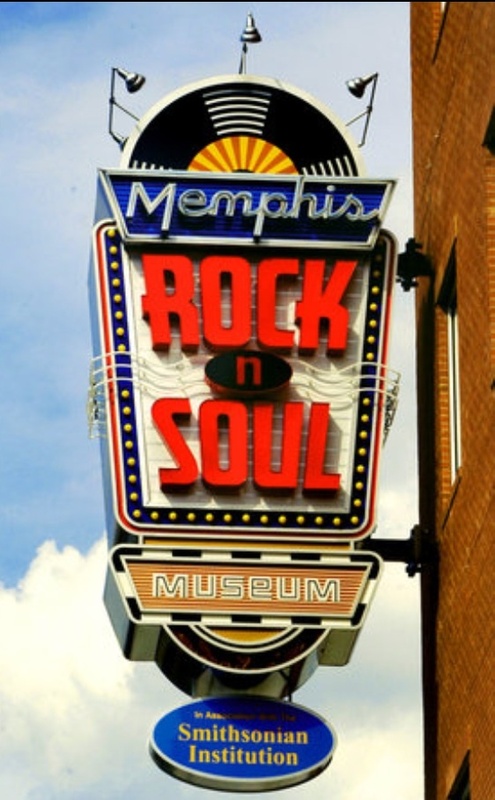 Down the street from the Memphis Rock ‘n’ Soul Museum is the Memphis Music Hall of Fame. While its not very large, it has some really cool pieces of memorabilia like 1/2 of a car that Jerry Lee Lewis once owned, a portable phone belonging to Elvis Presley, and several outfits worn by artists such as Bobby Blue Bland, Isaac Hayes and Al Green. While I found the displays somewhat scattered, I think they’re designed that way to give you an intriguing perspective of some of the best artists that have come out of Memphis. You can get through the whole museum in under an hour, but do plan accordingly so you are not rushing through. It was a full day and there was still so much to do! 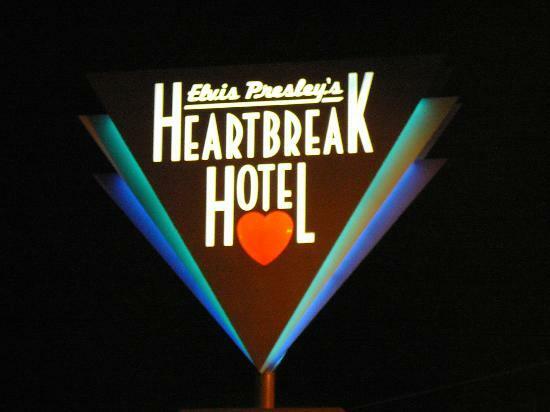 We decided to check into our digs for the next couple of nights, the Heartbreak Hotel. It’s down at the end of Lonely Street. It really is! Well at least for a little while longer until they open the new Guest House at Graceland across the street. Built in 1985, while the Hotel shows signs of age, the room we were in was extremely comfortable. Complete with separate bedroom, kitchenette and all the modern amenities including a continental breakfast, both my wife and I were really happy with our stay. And glad we had the opportunity be a guest there and experience the Hotel in it’s current location. The staff was fantastic, and we felt very safe with security as you approached the Hotel. After relaxing at the Heartbreak Hotel, we decided to head down to Beale Street to check out the action. However, I will leave that for Part 2, where we’ll spend some time exploring Beale street and partying at B.B. King’s. We will also make stops at Graceland, Sun Studio, The National Civil Rights Museum, and lunch at Central BBQ. And we will complete our tour of Memphis at Stax Records. Have you been to Memphis? What were some of your favorite spots to explore and dine? Please feel free to share your experiences or comments in the area below. We had a holiday in the US a couple of years back, visiting Nashville, Memphis, Clarksdale, and New Orleans among other places. Visited several of the same places as you in Memphis – the Rock’n’Soul Museum and Sun Records being particular highlights. I’ve written a few posts about the trip for my (British) blues blog, http://www.bluesenthused.com, with some more to follow – follow the links for ‘Adventures in the South’ if you’re interested.